Cholesterol levels have a direct relationship on the occurrence of coronary heart disease. Lower cholesterol and you reduce your chances for developing this deadly disease that strikes millions of people each year. Lower cholesterol levels also protect the body from numerous other health problems. There are different types of coronary heart disease that can develop from high cholesterol. All are the result of cholesterol building up in the coronary arteries, a network of arteries surrounding the heart, and forming a plaque that reduces the flow of oxygen that is vital to the function of the heart. Cholesterol in the arteries that causes them to harden is also called arteriosclerosis. This condition is accelerated in people who smoke, have high blood pressure, diabetes, and/or high cholesterol levels. When blood flow to the heart is reduced because of cholesterol a condition called angina develops. This causes chest pain which at times can feel like a heart attack. Angina is also a pre-indicator that there could be other serious heart problems. Rapid contraction of the coronary arteries causes spasms that cause chest pain. Heart attacks can also occur when you fail to lower cholesterol. This is a complete blockage of the coronary artery from excessive cholesterol plaque build up. Finally, a fatal result of not lowering cholesterol occurs when the heart rhythm is disrupted from high cholesterol. All of these conditions are considered coronary heart disease because the cholesterol plaque causes tiny clots that block the proper flow of blood to the heart. The most effective and lasting ways to lower cholesterol are through diet and exercise. A low-fat, low-cholesterol diet and exercise can lower cholesterol without the use of drugs and their harmful side effects. 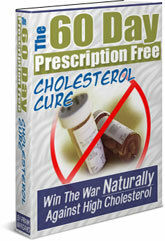 The complete plan to lower cholesterol naturally is found in The 60 Day Prescription Free Cholesterol Cure.